Children And TV. How Much Is Too Much? This page is about children and TV. It includes information about the huge amount of research that's been done into the effects of TV on children and how many hours of TV we parents can safely allow our children to watch. You might wonder what information about children and TV is doing on a website devoted to discovering the best books for kids. Well, as I was doing the research for this site, I realised that some kids just don't read for pleasure at all and I started to wonder why. I also looked more closely at what my own three children do in their spare time and found that they were watching alot more TV than I was really comfortable with. This led to the realisation that watching TV was probably filling many of the hours kids in the past would have filled with reading. Does this matter? After all, how important is reading these days? Is watching TV bad for children? OK, I guess most of us realise that TV isn't inherently bad. There are some wonderful shows on TV and it can be great, both as a learning tool and as a form of entertainment. The problem of course lies in the content of the shows we and our children watch and in the number of hours we spend watching TV. Here's what I found out about what's happening in our brains when we watch TV or, for that matter, are using ipads or other screens. When you're watching TV, the higher brain regions (like the midbrain and the neo-cortex) are shut down, and most activity shifts to the lower brain regions (like the limbic system) which are not involved in any cognitive functions. For adults, this basically means that your brain is in a kind of stand-by mode, doing nothing very much in terms of thinking. This is not great for adults, but for children the implications of a brain that's often in this stand-by, non-working state are even more serious. You see, young children's brains are developing at a tremendous rate. Almost everything is new to them so their brains are constantly taking in information about the world and processing it, forming a picture of the world and the people in it and, of course, learning new skills. We adults are often too busy to notice this but it's happening every waking moment of every day of your young child's life. It's why we often say that babies and small children are 'like sponges'. To learn all the things they need to learn at this stage, children need a variety of experiences every day. They need opportunities to play and to engage with other people and to use all five of their senses as they do this. In particular, they need to spend lots of one-on-one time with a caring adult. This is especially important for the development of their language skills. 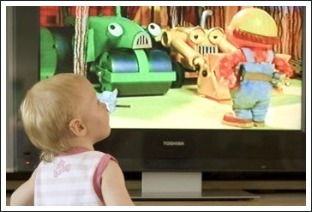 TV doesn't help children develop language skills because it can't respond to them. It's pretty clear that all this learning is not happening as it should if children are spending too much time watching television. In fact, the research into the relationship between children and TV confirms that TV has some serious negative effects, particularly for young children. Recent studies even suggest that watching too much TV can actually cause ADHD. Children and TV: How Much is Too Much? how much TV can we safely allow our kids to watch? 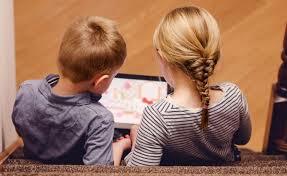 The recommendations about the maximum number of hours children should spend each week watching TV come from a study done by pediatricians at Seattle Children's Hospital called Early Television Exposure and Subsequent Attention Problems in Children. The researchers looked at the number of hours of television watched by children at the ages of one and three years and concluded that, for each hour of daily TV viewed by the child, the risk of the child showing signs of attention deficit hyperactivity disorder (ADHD) by the age of 7 increased by 10%. The study also looked at the effect of TV viewing on the academic outcomes of school-aged children and found that children who watched more than 10 hours of TV a week showed lower academic scores than children who watched less TV. 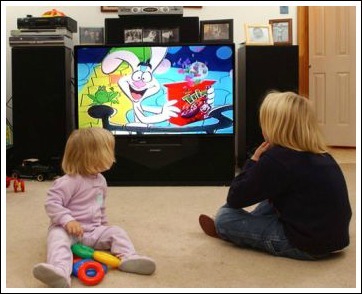 The main problem for both age groups was the negative effect of TV on children's ability to concentrate. The AAP's TV-viewing guidelines for children have been adopted by many government bodies around the world. For example, in France, TV shows aimed at children under 3 have been banned as a result of these findings. Food for thought, perhaps?